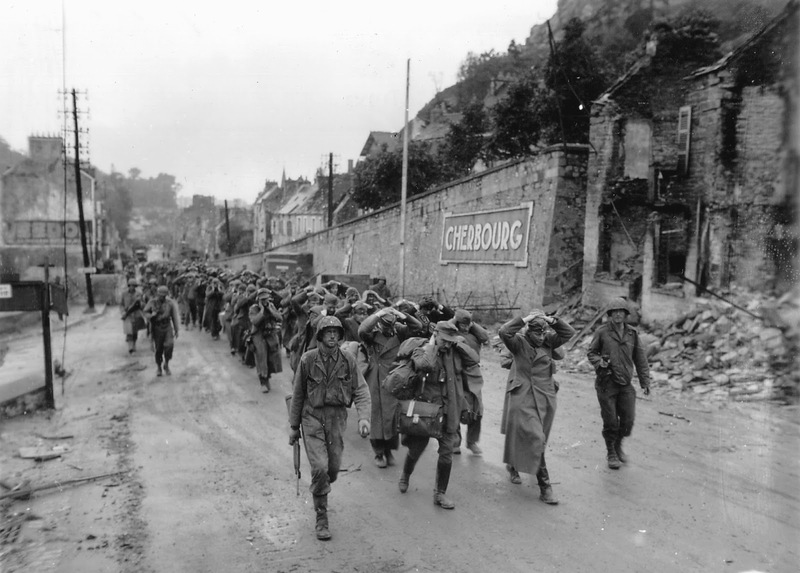 Monday, June 26 (AP) — United States assault troops battered into smoke-shrouded Cherbourg late Sunday from three sides, clamping a firm grasp on the city, and supreme headquarters declared at midnight that France's third largest port city was "almost in our possession." An Associated Press dispatch declared veteran doughboys broke into the city on the 20th day of the invasion under a shell-shocking artillery, sea and aerial bombardment that crumpled Nazi fight-to-the-death resistance. The power drive swept on against Germans still holding out in the main portion of the city, and several hours later supreme headquarters termed the city almost in Allied possession. German broadcasts earlier had written off the port as lost. Lt. Gen. Omar N. Bradley's men—trapping possibly up to 30,000 Nazis—smashed into the city from the south, east and west, said Associated Press correspondent Don Whitehead, who entered the city with the troops. 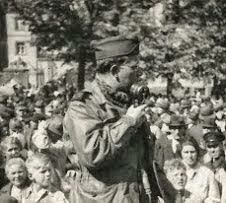 The Germans turned the harbor facilities into an inferno of destruction, he said. A tremendous artillery barrage from American task forces and field guns helped crush stubborn Nazi defenses on the outskirts, and the Americans won the high ground defenses overlooking the port city, supreme headquarters declared. Whitehead declared there remained last night only "the slow job of cleaning out the main part of the city." The outpost defenses were virtually all blotted out. Cherbourg's Harbor will provide a huge, efficient funnel to pour men and material into the Normandy Peninsula for grand-scale offensives designed to crush Hitler's Western Front. "At 6 p. m., there were only two strongpoints at Fort du Roule, and a few other scattered defense points, holding out" on Cherbourg's outskirts, Whitehead said. The last mile into the city was littered with Nazi dead—and streams of German prisoners marched back past them to prison pens, some in bunches up to 100. The Germans broke under the final, mighty American assault, unleashed at 2 p. m. without staging as much of a bitter house-to-house defense as many expected them to make. The tremendous Allied barrage struck the city's outskirts, with the city proper untouched by the massed destruction of naval and land guns. Allied air power which had started the ground assault three days earlier was withdrawn from the fight in its final crescendo since the Americans were at such close grips with the last German defenses that bombing would have endangered them. Big naval guns which came in on the last day concentrated on knocking out the last long-range batteries on each side of the port. Troops swarming down from the heights could see the Allied ship operations outside the harbor, laying a smoke screen and firing into Nazi positions. The direct dispatch from Cherbourg came shortly after Berlin radio admissions that "It is to be assumed that the Americans have succeeded in taking possession" of Cherbourg. Cherbourg lay smoking under Nazi demolitions. Its trapped defenders have been ordered to fight or be shot by their own officers. The bold task force lending support from the sea was commanded by Rear Adm. Morton L. Deyo aboard the United States cruiser Tuscaloosa. Even as the battle for Cherbourg raged to its bloody climax, British forces exploded an offensive before dawn Sunday along the Eastern Normandy flank, striking more than a mile south of captured Tilly-sur-Seulles, 12 miles west of the stornghold of Caen. This smash rolled more than a mile in four hours, engulfing a village, and then under heavy artillery support drove up into the "strongly defended German positions," a front dispatch from Roger Greene of the Associated Press said. The Germans threw in reinforcements, but were reported losing men "heavily." "Right yonder she is. See her?" "The hell it ain't; look at them fires."